Men and two cars decorated with text, "Pole to Pole Expedition" and "Around the World", parked in front of Rafu Shimpo building in Little Tokyo, Los Angeles, California, 1966. 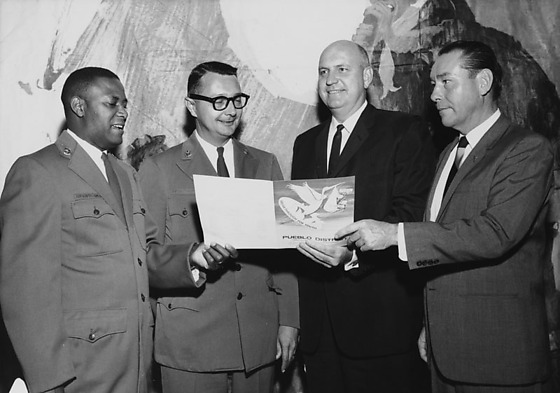 1P and 4N: Three Caucasian men in suits and one African American man in uniform hold a program with design of a stork carrying a bundle, "Breakthrough for youth". Man with eyeglasses has his eyes closed in 1P. 2N: Five men in suits stand apart on stage holding sheets of paper in front of a sign, "Follow the rugged road..." and a banner, "Breakthrough for youth". 3N: Eleven African American, Japanese American and Caucasian women stand on a stage holding certificates in front of a sign, "Follow the rugged road..." and a banner, "Breakthrough for youth". Typed on original envelope: Boy Scout -- Mr. Nakagawa, Jim -- c/o Fukui.